Education is basic, crucial and global right of human beings. 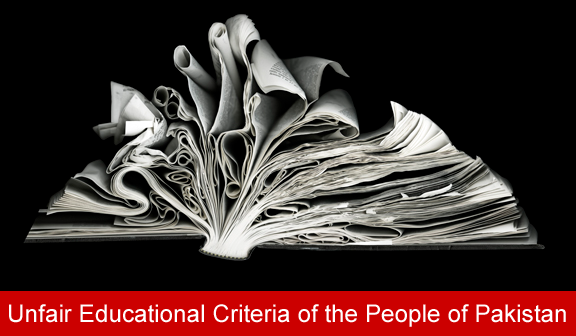 Every human on the earth have this basic right to be an educated person. It was acclaimed by the Universal Declaration of Human Rights and it is also revealed in international human rights convention. Constitution of Pakistan also gave it vital importance that every citizen has the right to be educated, declared in article thirty seven. All 189 United Nations members and 23 international organizations team up to help achieve the Millennium Development Goals by 2015. There are total 8 goals to be achieved by 2015, and we have only a year to achieve these goals. One of them is that to assure that every child get the basic primary education regardless of the gender factor, which may be a boy or a girl, the child must have the right and source to attain full course of elementary education in schools. In 2010, the population of Pakistan was about 173 million; of them the ratio of males was greater than females. The ratio of males and females is 108 males per 100 females. Pakistan is devoted to omit inequality of education of boys and girls due to the commitments with international agreements and conventions. It is sad fact that inequality of education takes place worldwide, especially in the developing countries, unfortunately Pakistan reside in this category. Biased educational culture is found on a very large scale. Unfortunately, Pakistan was at number 129 in attaining educational goals out of 135 countries. Our literacy rate for women is very low as almost 50 percent of the girls were unable to get education. The marriage of pre-mature girls is also a very big reason of educational failure, latter they become illiterate mothers eventually causing poverty of the society, as they are unable to educate their children. Quran also teaches to learn, but the Pakistani Muslims are unaware of the teachings and spirit of Islam. Gender biasness is also caused by poverty and illiteracy of the parents, also parents cares a lot about the security of their daughters. Regardless of the gender inequalities, there are huge opportunities available to be an educated citizen. The private educational zone is extended at a huge level, making education more complex, as parents have to decide whether to send their children to government institute or private to minimize the cost of education. More people send their children to private schools rather than government schools due to the difference of the standard of education. Another main factor of inequality is of learning. There are very poor learning standards in public schools and irregular behavior of teachers is very common. Thus government institutes generate low learning outcomes as compare to the private sector. Also the job opportunities are available as per the standard of the institute attended. So people mostly chose private institutions. Inequality is not a natural phenomenon; it is created by the people and their standards. At present time it is mostly caused by the state policies, their nature, cultural context and traditions found in our societies.